There are two more WMS Gaming slot games added today. 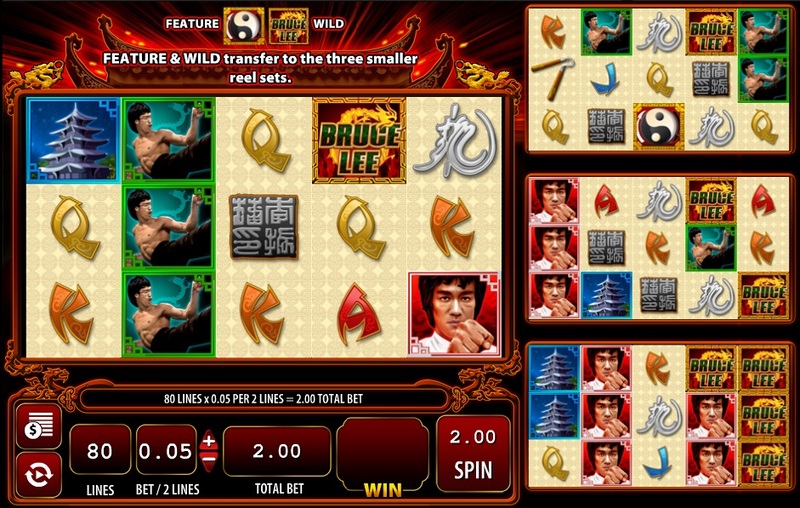 The first one is a rather special and unique slot game called Bruce Lee, Dragon’s Tale. This game has 80 paylines, 20 on each slot. You have one main slot game and 3 smaller ones. All with 20 lines. The cool thing about this slot is the fact that wild symbols and scatter symbols transfer from the main slot to the smaller slots. Making the chance for higher wins or bonus games bigger. You are awarded 10 free spins with a 3 times multiplier when you get 3 or more scatter symbols on one slot game. Get it on two slot games and the multiplier goes to 6, for three games to 9 and get the bonus game on all 4 slots at the same time you are awarded with a 12 times multiplier. During the free spins stacked symbols and stacked wilds appear more often. And second they have added a popular title at land-based casinos, Black Knight II. If you liked Black Knight, you are going to love this one even more. Black Knight II comes with 40 lines and stacked symbols on all reels. The bonus game is still the classic game from the original. 7 free spins when you get 3 or more scatter and/or wild symbols from left to right. And as you might know, during free spins any wild symbols that appears will cover the entire reel and stay on the reels for the remaining spins. Black Knight II is one of those slot games that can pay out huge! I also added a video of this game below. These games are now available at Slots Magic.